I was quite happy with my first proper suit, the Camaro Semi Dry, but after a weekend diving in the cold Lake Hemmoor in northern Germany I decided to invest in a drysuit. I heard about the company Robin Hood Waterworks on the UK.Rec.Scuba.Org Mailinglist, where the company was named as having an excellent cost/performance ratio. After browsing a bit more, I found the website of Pro Cover, its sole German distributor. I mailed them and wrote about my interest in their drysuits and was sent a price list and measurement table (the suits are made to measure!). I then called Ralf Maslak of Pro Cover to discuss all the necessary details. It is yellow! When ordering the suit, there's a choice of available colours. I chose a black/yellow combination. The suit is extremely light, even compared to other trilaminate suits. A closer look reveals a distinctive feature of the RoHo suits: the parts are glued together, no stitching involved! I had heard about this in the newsgroup - it was reported that it proved to be hard-wearing and durable! Well, we'll see! The legs are reinforced from above the knee to the boots, so it is possible to crawl over pebbles when leaving the water. The boots themselves look like ordinary wellies. The valves are made by Apex and set tidily into the middle of the chest part. The first impression is a good one and the fit is excellent, too, thanks to its having been made to measure. Getting into the suit is no problem - the zip is wide enough. The zip is located on the back, reaching from shoulder to shoulder, so a buddy has to help to close it. The hood is quite thick (I would guess 7mm neoprene), has a relatively small open face field and is quite tight. It definitely needs some getting used to and at first I thought it was too constricting. The advantage is, of course, that very little water seeps in and the head stays very warm. I lost my original RoHo hood and had to use other brands for a year until I decided to get a new RoHo one. It's a major difference and I'm glad to have this sort of hood again! 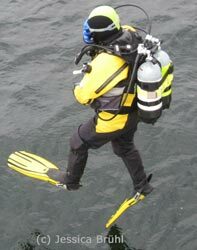 In contrast to my Camaro suit, there have never been any problems during a dive with sudden (cold) water seepage. Standing in the suit, the boots appear to be extremely thin and soft and not especially robust, but when walking over gravel it soon shows that the soles are much better than expected and it is quite comfortable to walk in them. There is only one thing I find slightly irritating: the fin strap holder is located very low on the booties, therefore giving the impression that the strap is about to slip. I like my fin straps quite high up and find it vexing that it always slips a bit lower. However, my original fear that the straps would slip off completely has never been realised. Even in strong currents the fins stay fast on the boots - as if they were glued on! What else is there to say about a suit that fulfils all expectations? 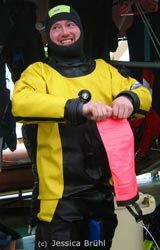 If you are looking for a good, robust drysuit at a reasonable price and if excellent service is important to you, then a RoHo drysuit might be just the right choice!